June 11, 2015 – High school graduates, adult learners, military members, and non-traditional students will have a unique opportunity to become a Wildcat student and earn their college degrees at an upcoming event. Fort Valley State University is hosting two Enroll Now sessions on Saturday, July 11 and July 18, from 9 a.m. to 1 p.m. in the Troup Administration Building. 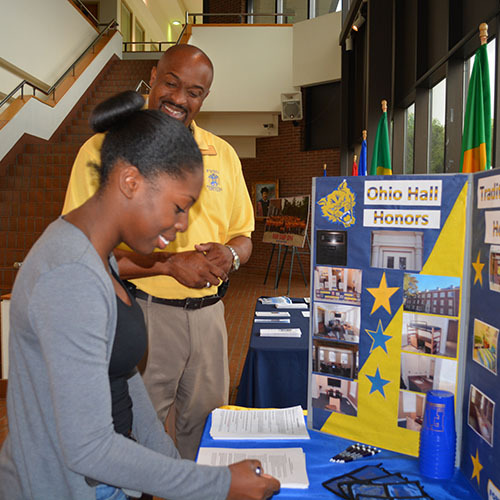 During the enrollment sessions, FVSU staffers will be on-hand to provide on-site admission decisions for fall 2015. “This event is designed to assist people that have been out of school, and who are closer to making a decision to return to school this fall,” said Sha-Ron E. Jones, FVSU’s director of Recruitment. Jones said that staffers from financial aid, residential life, the cashier’s office, and admissions will help guide prospective students through the admission and enrollment process. Academic counselors will be present to advise admitted individuals about selecting classes for their degree program for Fall 2015. Some students may need to take the COMPASS test at a later date to complete course placement. To qualify for an admissions decision, individuals are required to have official final transcript(s) (in sealed envelopes from their prior school) and official test scores from the SAT and/or ACT. Individuals should also have a completed FVSU application. The application fee is waived. All applicants must meet FVSU’s minimum admission requirements. “It’s a great time to return to school and make FVSU their choice,” Jones said. For details about the upcoming Enroll Now sessions, contact Jones at (478) 825-6348 or email joness@fvsu.edu.